Journalist John-Allan Namu broke the news on March 9th that world-renowned cartoonist Gado had been fired by the Kenya-based Nation Media Group newspaper syndicate. Below is some of the international reaction to Gado’s firing. It was almost 20 years ago that I first met Gado, while I was working on a international development project in Kenya. I recall telling my secretary that I was going to be out of the office for an hour having lunch with Gado. Her jaw dropped and she quietly said, “You know, he says the things that we’re all thinking but are afraid to say.” She acted as if I was going to have lunch with Michael Jackson. I then realized that in many developing and emerging democracies, cartoonists are treated like rock stars. They had incredible influence way beyond their paygrade. In fact I eventually came to understand that a good political cartoonist in an emergent democracy is probably the most cost-efficient change agent in the society. The right cartoonist, in the right place, at the right time, with the right cartoon, could bring down a government. It doesn’t happen often but it comes close more times than a person might think. Other individuals in the society have much more power, more clout, even the head of state has an army. But who can have that much influence over societies’ political views than someone who’s paid five dollars for his cartoon that day. Gado has been in the crosshairs of a number of different governments in Kenya, not just because of the power of his cartoons, but because he plows the way for other cartoonist to be daring as well. Now it looks like his newspaper, the Nation, is finally caving in to that long-standing political pressure. It’s entirely the right of a newspaper to sack a cartoonist or any other journalist who fails to follow the general political policy of that newspaper. But that not what’s happening here. The government of Kenya is finally succeeding in sending a signal that it’s in charge of the media, it wants to regulate what people read and how they think, and perhaps the days of the enlightened Free Press in Kenya are now beginning to come to an end. Every journalist, every reader, no matter what their political persuasion, must take this action as a warning. Cartoonist Rights Network International stands with Gado. We call on the publishers and acting editor of the Nation to reinstate Gado and play the role that they should play in society. The newspapers, publishers and editors should be the front line of the defense of free speech in the country, not the individual journalist. While in this case the cartoonist is the practitioner of free speech, the publishers and the editors are the defenders of free speech. Perhaps the Nation’s readers can boycott the paper and thus send a message upstream that Gado is one rockstar who shouldn’t be messed with. “It seems clear from the sequence of events that the termination of Gado’s contract with the Daily Nation has more to do with his unsparing political commentary through his cartoons, and as such, is intended to undermine his right to express his views freely, than for any other reason. This is distressing and wrong; it undermines Kenya’s own tradition of satire. 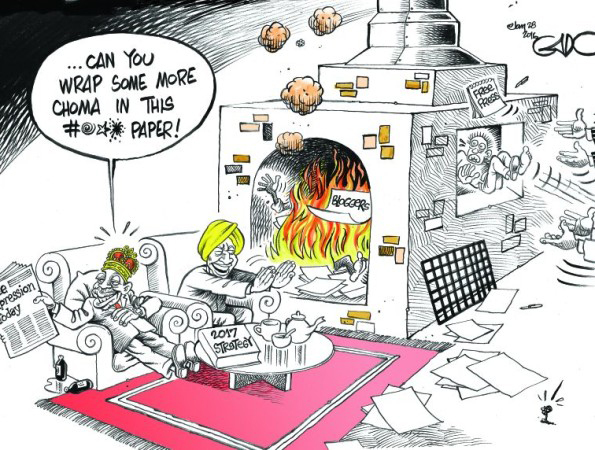 This does not bode well for Kenyan democracy and is another indicator of rising intolerance against political criticism by governments in many parts of the world.” Complete PEN International statement in support of Gado here.